Have you ever had the experience of needing to know the temperature for cooking a steak, pork tenderloin, etc? It’s annoying. That’s why we created this Meat Temperature Guide. It’s a handy resource when you need to know the temperature for cooking pork, beef, or chicken. It has a sleek design (pats self on back) with a cutting board background and white border. It’s magnetic and can be conveniently placed on the refrigerator. Never again will you spend time “googling” the answer while you’re trying to cook. Whether you’re grilling, baking, or smoking this meat temperature guide has you covered. You can buy it in our store HERE (free shipping)! Different cuts of meat, different temps of heat. Some cuts of beef and pork require higher temperature than the USDA minimums. Specifically, beef brisket and pork shoulder need to be cooked to a much higher temp to allow the tough fats to properly break down and render. If you cooked a pork shoulder to the same temperature as a pork loin, the shoulder would be fatty and very tough to eat. 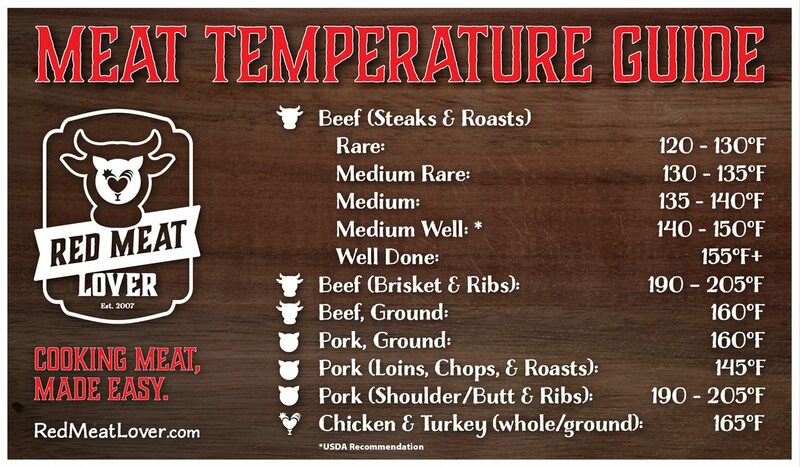 This meat temperature guide includes suggestions for various cuts of meat. Tip: It can be tough to get a good temperature on ribs due to the bones. Try the Bend Test instead. A big concern, especially when cooking for others, is that the food is cooked properly. I don’t know about you, but I want to be sure the meat is cooked correctly…..but also not overcooked or dry. Who wants to eat dry pork loin? Yuck. Having a proper meat temperature guide AND having a good thermometer are two essential resources in the kitchen. No matter how hard you work to make a great dinner, nobody will care if they leave sick. Whatever you’re cooking, make sure it’s cooked properly and thoroughly. Chicken, turkey, pork, and ground beef all must be cooked to certain minimum temperatures to kill bacteria and avoid illness. While the USDA suggests a temperature of 145 degrees F (medium well), many steaks are safe at lower temperatures of 120 – 130 degrees F (rare). 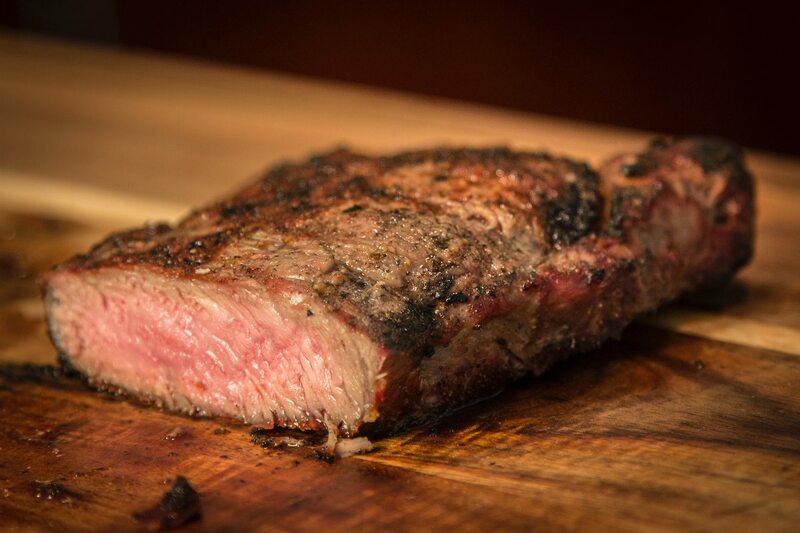 Buy this meat temperature guide and make a perfect steak every single time!